A lit neon sword represents perhaps the pinacle of any sword-swallor&apos;s repetoire. It is difficult to think of anything more dangerous to try and swallow. The video link shows Hannibal Hellmurto swallowing this neon sword, which has a blade length of just over 20 inches! In October 2011, the Curse of the Devil Doll (lot 666 in this auction) struck again live on stage at the Circus of Horrors&apos; Bradford show during Hannibal&apos;s sword-swallowing act. This neon sword, made of a bent glass tube filled with mercury and powered by 3,000 Volts (yes, that&apos;s three thousand volts!) ripped a hole in Hannibal&apos;s oesophagus, putting him in intensive care for a month and being kept alive on drips and tubes, as he couldn&apos;t eat or drink anything whilst the injury had to be left to heal itself naturally. Perhaps wisely, Hannibal has now decided to part with his neon sword. The sword comes with special extra long high-voltage cables enabling the 3000v power supply to be hidden in the wings of the stage. All contained in its original wooden travelling trunk. Hannibal will be at the auction to personally autograph the sword and pose for a picture or two with the lucky buyer, and also to advise you not to even think about trying to do what he does for a living!! 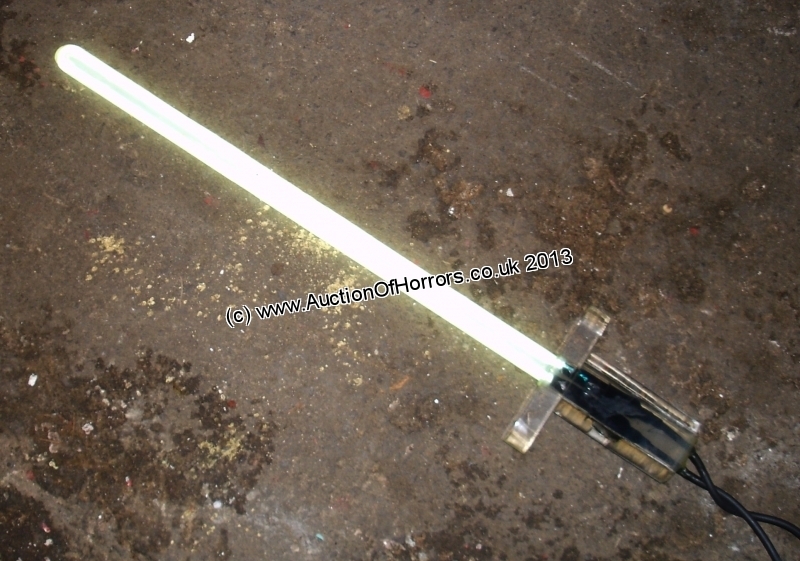 SAFETY NOTE: The neon sword will be lit up and working at the auction, but like all electrical items, due to health and safety etc. we have to sell it as a non-working display item only. By buying you agree to have it tested by a suitably qualified electrician before use... and of course, we don&apos;t advise anyone to try swallowing it!